Often, organizations have difficulties in recognizing the need to change. Nicole Zimmermann investigates the barriers to, but also in particular the drivers of organizational change. From the case-specific as well as from a generic study, a structural model results that is able to explain how environmental and cognitive drivers, inertia and managerial attention interact. Accomplishing organizational change is a challenging managerial task. Often, organizations have difficulties in recognizing the need to change. 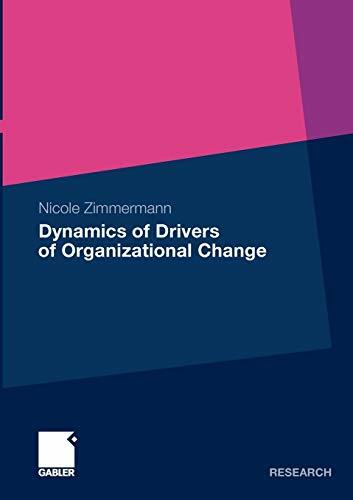 Nicole Zimmermann investigates the barriers to, but also in particular the drivers of organizational change. She places special emphasis on a systemic perspective―using system dynamics modeling―and makes use of a case study of the move to electronic trading at the New York Stock Exchange. It is the first investigation of this transition from an organizational perspective. The causal and dynamic analysis reveals the complexity of change. From the case-specific as well as from a generic study, a structural model results that is able to explain how environmental and cognitive drivers, inertia and managerial attention interact. Jun.-Prof. Dr. Nicole Zimmermann wrote her dissertation under the supervision of Prof. Dr. Dr. h. c. Peter Milling at the Department for Industry and Operations Management at the University of Mannheim.